4c1f-ccd4-1c03 is the MAC address of the bridge. The bridge with the lowest bridge ID is elected as the root bridge. If the bridge priorities are equal, or if the bridge priority is not configured, the bridge with the lowest MAC address is elected the root bridge. How to change the bridge priority on Huawei switch? [Huawei]stp instance 1 root ? The first option changes priority to 0, the second to 4096. Default bridge priority equals to 32768. 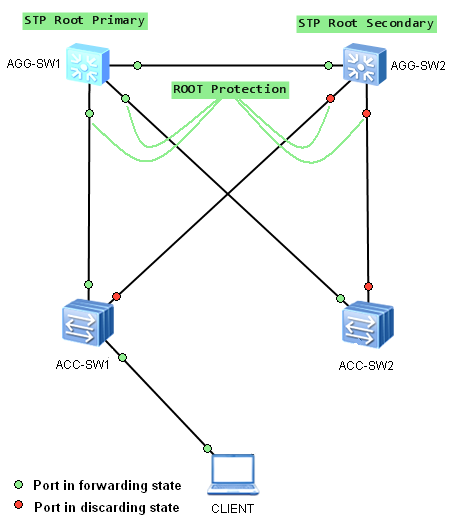 Aggregation switch AGG-SW1 was elected as the root bridge and AGG-SW2 as the secondary root bridge, in case of AGG-SW1’s failure. 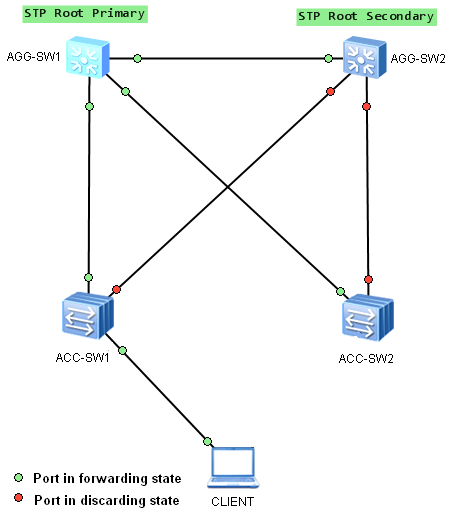 STP topology was built as expected, fast speed links are used to forward traffic between devices. Our PC was elected as a new root bridge for this VLAN. 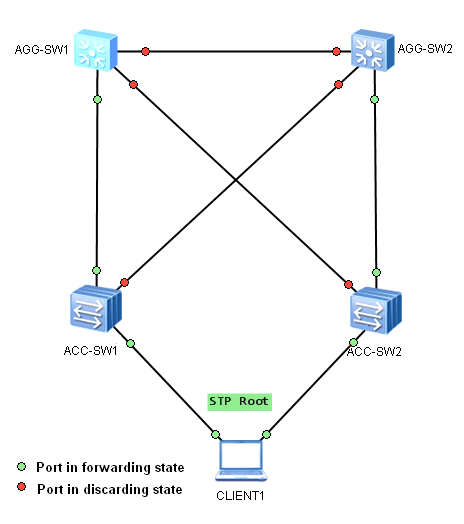 STP topology was changed and now, low-speed access links are used to forward traffic between aggregation switches. If more data flow via the aggregation link in that VLAN, than this link can accommodate, the drop of some frames occur. As a result, network performance can be affected. Remember, that root protection takes effect only on designated ports.